Everyone likes a feel-good story. And we’ve had lots of them in recent weeks. All are something Galionites can brag about. Galion’s 10U Little League all-star team won a state championship Saturday. The title game was a 10-5 victory over Tallmadge. It capped off an undefeated post-season run for the locals through the District 7 and state tournaments. It’s Galion’s first Little League state title. Members of the team are Arius Swaim, Braxton Prosser, Carson Campell, Carter Walters, Jimmy Hardy, Johnathan Maran, Korey Walters, Landyn Prosser, Max Albert, Quinn Miller, Trey Longwell. The coaches are Ryan Alber, Tom Swaim and Sean Walters. Congrats on a fantastic accomplishment and the creationof memories that will last a lifetime. Also on Saturday, Galion’s Mary Shoup organized a Take Back Your Community rally at Heise Park in Galion to bring focus and attention to the problem of drug addiction in Galion and most Ohio communities. Shoup, a recovering addict, will not be deterred in her efforts to talk about a problem many refuse to see. From noon to about 11 p.m., she scheduled speakers — from recovering addicts who shared their stories, a police chief, to people affiliated with rehab centers across the nation — and music and made available information for anyone looking for help for themselves or for someone they know who needs help fighting an addiction. The crowd wasn’t huge. But Shoup estimated more than 100 people gathered during the day to hear testimonials, to share their own stories and to seek help. Three people took advantage of her offer to find them help to fight their own addictions. Those three are headed to rehab centers: One in Alabama, one in California and one in Ohio. Shoup has formed a non-profit, Rally for Hope, which she is using to better spread the public awareness of the drug problem in Ohio and in towns and villages like Galion. You can read more about her group and her efforts on her Facebook page. The new venture Harding Way West will soon be able to sell it’s own “made-in-house” wine products, along with other products. There is a tasting room and owners Ron Fox and Steve Arlen have other plans for their new biz. You can learn more about the business in the Fox Winery Facebook page. City leaders and business throughout the community are trying innovative ways to get locals more interested in visiting and spending time and money in Galion. Chris Stone’s 1803 Taproom on Harding Way East regularly brings food trucks to the community. They set up in front of his Harding Way East business, order some food and go inside to taste the craft beers the taproom offers. Read more about the taproom on Facebook. Also opening in the near future in Galion is the Iron Vault Distillery on Harding Way West, in the former building occupied by Longstreth Memorials. A few months ago, John Bassett and Sam Thacker purchased the building where they plan to open their distillery in the fall. They are doing a little remodeling and setting up shop in an effort to brew and sell specialty spirits, such as rum, vodka, single malts, gin, bourbon and moonshine. There also will be a tasting room. The Iron Vault Distillery is a work in progress, as is its website, but you can learn more about it online. One other local business doing something a little different to lure customers is the Candi Bar, also on Harding Way East. 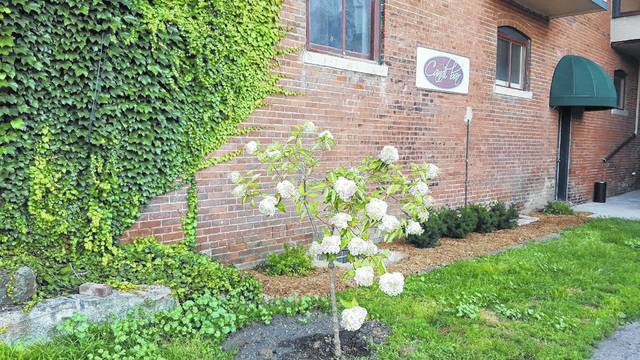 Owner Beth Cramblett has beautified the back entrance to her establishment by doing a little landscaping on the small area of grass next to that rear entrance. You won’t see it if you enter off of Harding Way East. But I see the greenery and plantings and new mulch each day I walk into my office next door. It looks very, very nice and is a welcome addition to the neighborhood. You can read more about the Candi Bar on it’s Facebook page. There are more stories, many of them having to do with the uptown Galion area. Topia Boutique recently moved to a prime location on the square. It too is a pleasant addition. Restaurants and stores and shops in the area are doing everything they can to increase business and get more people to visit the downtown area. Some have set up areas on the sidewalks to show off their wares for guests to eat and drink or sip and share. The Brush and Palette Art Gallery has special programs and showings to showcase area artists. If you’ve not been there, it’s something that is worthy of a visit. I’ve not yet visited Galion’s newest gallery, Galion Contemporary Artspace, also in uptown Galion, which was opened in February by Galion High School graduate Meg Frazier. But Frazier also is aggressive in her efforts to make her business, and the downtown Galion area a place to visit. These success stories didn’t happen by accident. They happened thanks to hard work. And they should be celebrated. Russ Kent is editor of the Galion Inquirer. Email him at rkent@aimmediamidwest.com with comments or story ideas.